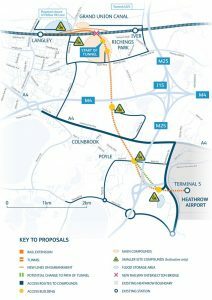 Network Rail is to open a consultation the western rail access to Heathrow Airport (WRATH) plans. The final round of consultation on the potential new rail link from Reading and Slough to Heathrow Airport opens on 11 May 2018. Linking the Great Western Main Line to Heathrow is one of the most important ways of increasing the use of public transport to get to the airport, thus relieving local roads of some of their traffic. The link would allow passengers from the West to travel directly to Heathrow Airport from Reading and Slough, without having to change at London Paddington. This would make journey times to Heathrow as short as 26 minutes from Reading and just 7 minutes from Slough. Finalised plans are expected to be published in late 2018/early 2019. A Development Consent Order application will subsequently be submitted to the Planning Inspectorate in 2019. This will seek the required consent to build the new railway in line with the plans that have been developed, with a final decision by the Secretary of State for Transport. The consultation will run until 22 June 2018.